Previous literature has widely regarded stability values in organizational culture as a necessary evil at best and proposed their reduction to shape innovation. Our study expands the literature by empirically exploring the relationship among stability values in organizational culture, management control (MC), and managerial innovation. Managerial innovation is important for every organization because it contributes to technical innovation in the long term and is directly or indirectly associated with firm performance in a positive way, but its success or failure depends on a process of diffusion through the organization as a social system. 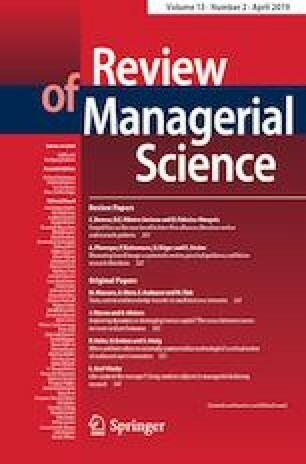 Based on a survey of 260 large German firms, we find that managerial innovation has a negative association with the degree of stability in organizational culture but a positive association with an emphasis on three of the four tested MCs, namely, action controls, personnel controls, and cultural controls. We reveal that a large extent of the negative effect ascribed to stability in organizational culture is caused by a lack of emphasis on cultural controls rather than by the degree of stability itself. Furthermore, we go beyond the assessment of stability as purely “good” or “evil” by generating empirical evidence of the positive fit between stability and cultural controls for managerial innovation, following contingency theory. According to our findings, organizations with a relatively high degree of stability in their culture (e.g., bureaucracy or hierarchy) may be enabled to shape managerial innovation through cultural controls. This paper is part of a larger research program. We are grateful to Stefanie Einhorn, Jan Endrikat, Bernhard Fietz, Edeltraud Guenther, Takehisa Kajiwara, Hirotsugu Kitada, Katsuhiko Kokubu, Kimitaka Nishitani, Matthias Walz, and Qi Wu, who contributed to the survey design and collection of raw data for the entire research program, from which we use some variables for our study. Earlier drafts of this paper were presented at the 9th EIASM Conference on Performance Measurement and Management Control in Nice (France 2017), at the 40th European Accounting Association Conference in Valencia (Spain 2017), the Management Control Association Conference in Groningen (The Netherlands 2017), and the 14th Annual Conference for Management Accounting Research in Vallendar (Germany 2017). We acknowledge the helpful comments from all the participants, especially Klaus Derfuss and Stephen Jollands. Finally, we thank the editor Ralf Ewert and two anonymous reviewers for their constructive suggestions and guidance. Managerial innovation survey items (see Table 7) are measured on 7-point Likert scales. Midpoint and endpoints labeled as categories (1 = strongly disagree; 4 = neither nor; 7 = strongly agree). The indicators are adapted from Vaccaro et al. (2012). Organizational culture survey items (see Table 8) are measured on 7-point Likert scales. Midpoint and endpoints labeled as categories (1 = strongly disagree; 4 = neither nor; 7 = strongly agree). The indicators are adapted from Lukas et al. (2013). 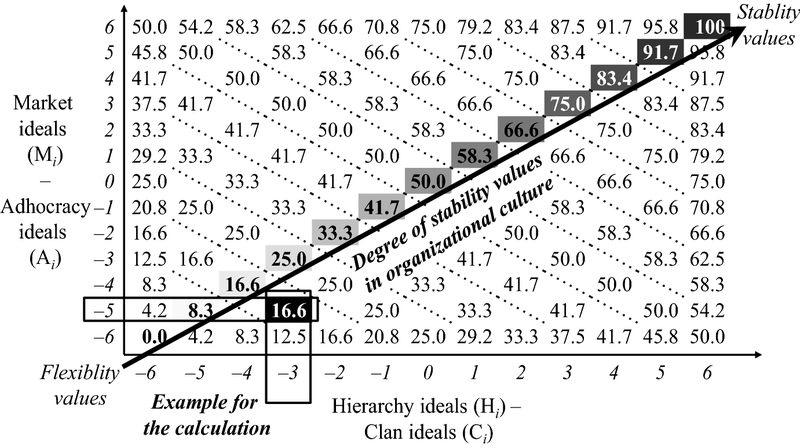 On the basis of the survey data, we calculated distance measures to assess the degree of stability values in organizational culture (see Fig. 3) for each of the four aspects of organizational culture ideals, namely, the dominant attributes (i = 1), the leadership style (i = 2), bonding (i = 3), and the strategic emphases (i = 4): stability valuesi = hierarchy ideals (Hi) − clan ideals (Ci) + market ideals (Mi) − adhocracy ideals (Ai). For instance, if a respondent rated the aspect leadership style (i = 2) with a score of four for hierarchy ideals (H2 = 4), a score of seven for clan ideals (C2 = 7), a score of two for market ideals (M2 = 2) but a score of seven for adhocracy ideals (A2 = 7), then the distance measure for leadership style is (H2 − C2) + (M2 − A2) = (4 − 7) + (2 − 7) = (−3) + (−5) = −8. The distance measures indicate a rather low degree of stability values in organizational culture. To simplify interpretations, we calculated rescaled scores for the distance measure (stability valuesi) that range between 0 (flexibility) and 100 (stability): stability values (rescaled)i = ([stability valuesi] − min)/(max − min) = ([stability valuesi] + 12)/24 × 100. For the example of scoring of leadership styles, it yields the following: stability values (rescaled)2 = (− 8 + 12)/24 × 100 = 16.67. Management control survey items (see Table 9) are measured on 7-point Likert scales. Midpoint and endpoints labeled as categories (1 = strongly disagree; 4 = neither nor; 7 = strongly agree). Indicators for results and action controls are adapted from Jaworski and MacInnis (1989), indicators for personnel controls are adapted from Snell (1992), and indicators for cultural controls are adapted from Widener (2007).